If you’re in the market for a generator to light up the dark nights around a campground, you’ll need a reliable model. Likewise, if you’re going off-grid and cutting yourself free of your mains electricity supply, that generator must come equipped with home standby dependability. In short, if a power providing infrastructure is unavailable or just unreliable, you should own a trusty portable power source, a gas-fueled machine that you can depend on as a backup energy source. Ease those concerns by considering a Durostar DS4000S Generator, an engine/alternator combo that delivers 4000-Watts of power. The feature-rich capabilities of this rugged machine include an EZ-Pull recoil start, a sensitive mains circuit breaker, a must-have muffler system, and three 120-Volt outlets. At 94-lbs, the gas-powered (unleaded gasoline) standby unit is portable enough to accompany you on your camping trips and other outdoor activities, but there’s an optional wheel kit for those who don’t feel like pushing that lightweight frame. Let’s check out some specs, then you can compare the features to the price. Come on, you’ll discover just how reasonably priced the DS4000S really is, especially when you compare it to some of the other models on offer at the same price point. Ideal for recreational activities, night work, and natural disaster backup duties. 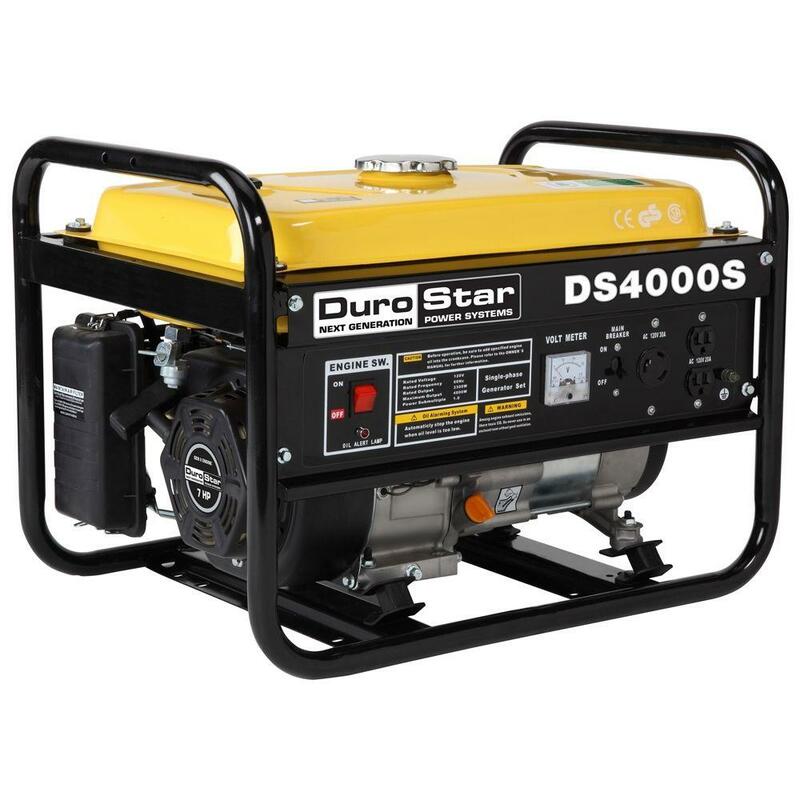 Let’s start your detailed look at the DuroStar DS4000S Generator by measuring its power output characteristics. This workhorse backup power provider delivers 120-Volts, 20-Amps, as you can see when you check out the two three-pronged outlets. Stacked one atop the other, the tough outlets can easily power most home appliances, should you care to bring them along on your camping trip. Additionally, there’s a single 120-Volt, 30-Amp positioned just to the left of those two power outlets. This rounded socket uses a twist-lock mechanism to hook up high-amperage power tools and the other energy-hungry equipment you’ve chosen to accompany you. 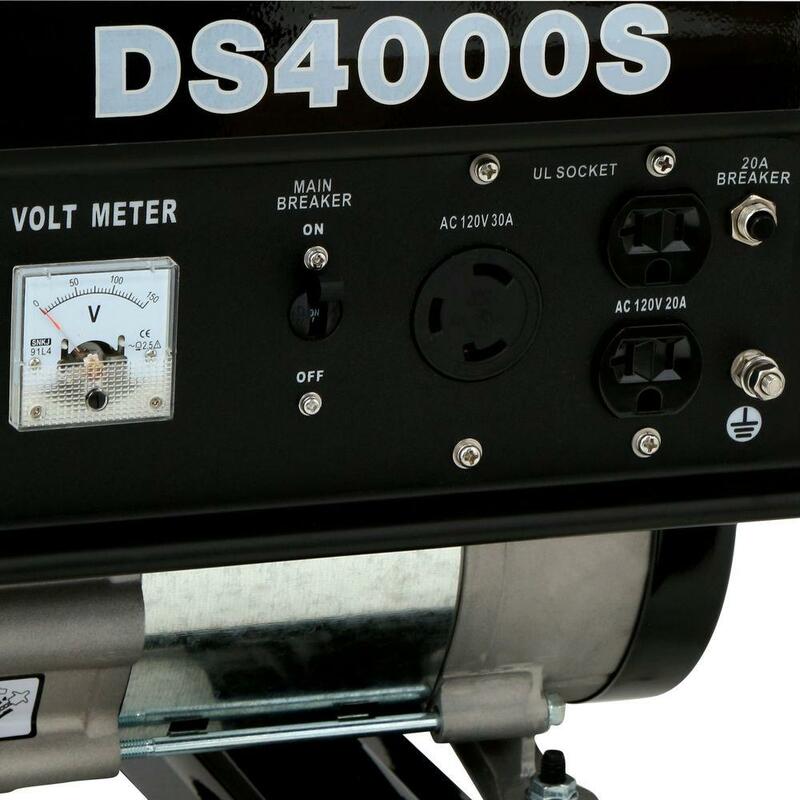 Incidentally, the DS4000S label indicates a 4000-Watt rating, although this power is only available as a peak offering. The standard running Wattage rating hangs comfortably around the 3300-Watt mark, which means the portable generator has more than enough raw oomph to keep your essential electrical products energized when you’re off-the-grid. The heart of any portable generator, the engine, spins the electrical windings at a carefully regulated pace so that a smoothly regulated power supply is maintained. In this gold standard backup power performer, a stout 7-HP Durostar OHV engine features an air-cooled architecture that imbues the prime mover with reliable speed control. Regulated by a 4-Stroke, single cylinder overhead valve design, that engine sits on a stabilized cradle alongside 4 entirely independent motor mounts. The lifeblood of that quietly purring engine is stored inside a top-mounted 4-Gallon fuel tank, so expect 8-hours of extended operation when the power output requirements hit the mark at 50 percent of this generator’s rated full load. Of course, since you’re filling the tank with unleaded gas, a quick stop at any local gas station is all that’s required to ‘fill her up,’ as it were. Next on the agenda, the oil level needs to be managed if the DuroStar 4000S Generator is to operate at its best. With that in mind, there’s a low-oil shutoff embedded inside this backup generator. It protects the motor if the oil level drops dangerously low. Furthermore, that potential hazard is shown on the control panel as a ‘Low Oil Alert,’ located just below the big red ‘Engine Switch.’ By the way, there’s also a ‘Volt Meter’ and a ‘Circuit Breaker’ installed on that tidy little control panel, so you know safe operating procedures were foremost when this little beauty was first conceived. 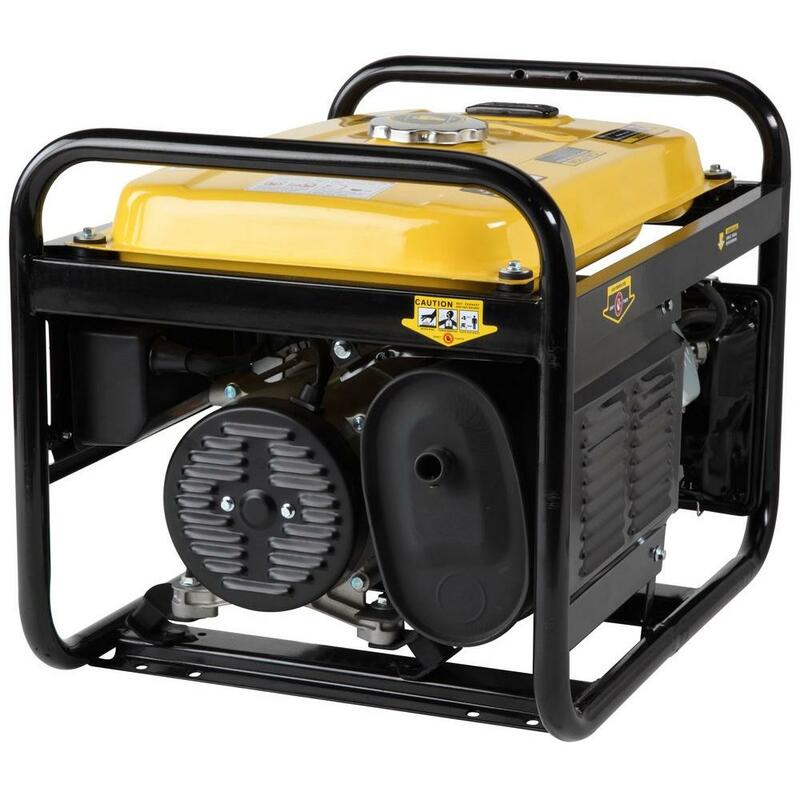 Take heed, oil is NOT supplied with this portable generator when it ships, so be sure you pull out your funnel when it arrives on your doorstep. Open the oil tank, fill it with 20-Ounces of 10W-30, then check the oil and fuel levels. Do all of this before you even think about testing the engine. Yes, the generator does have a low-oil shutoff, but the better operational practice here is to obey the ‘Low Oil Alert,’ should it come on and to read the manual while following all engine-related safety protocols. Given that the rugged steel frame is so compact, the start type associated with the generator is manual. You’ll see it referred to in the included manual as an EZ-Pull recoil start, which is marketing speak for an easy to engage engine crank cord. Now, you’ve seen frustrating video clips of folk trying to crank various old engine types. Well, that’s not about to happen here, not when the EZ-Pull mechanism makes the start cycle a cinch. That’s a feature that’s sure to appeal to you if you’re a little older or you have a bad back. Happily, manual starting is a no-brainer on this popular backup machine from DuroStar. Considering your efforts at that late night, pitch dark work site, you might be tempted to send a hearty thank you letter to the manufacturers, one that praises this effortless engine triggering sequence. After all, whether it’s a day of hammering tent pegs into the hard ground or an evening of arranging your emergency appliances for an infrastructure breakdown, a quick starting generator is just what you need to chase away the night’s shadows and illuminate everything with electrical light. A few brief mentions have touched upon the functions framed by the control panel. From left to right, you have a chunky power switch and an accompanying low oil LED. Next, three outlined tables of text instruct you on the core features and specs held inside this resting beast. This is a Single Phase Generator Set, and you must be Cautious when running the equipment. Those warnings and instructional data chunks are followed by a concise breakdown of the DuroStar DS4000S, one that lists the power output info. Moving on from the clearly rendered text, the voltage output meter and circuit breaker dominates the middle of the control panel. That’s yet another handy pairing, with the indicated voltage providing feedback when the circuit breaker detects a problem, not that trouble is likely. However, should one of your appliances cause a short-circuit, that breaker is ready to snap open and isolate the power output. Finally, on the far right, 3 power outlets are ideally located to host your electrical equipment. First off, a rounded 120-Volt, 30-Amp socket provides twist-lock convenience. Take note of the higher current output, especially if you’re going to be plugging in any power tools. The smaller set of 2 paired power outlets, one above the other, delivers 120-Volts, 20-Amps of general-purpose electricity, which is more than enough to run a set of lighting fixtures or a mini refrigerator. Even a TV or a small AC unit will comfortably come to life when they’re plugged into these power sockets. What good is a state-of-the-art portable generator if it keeps you awake when you need it most? An electric fan is whispering silently in one corner, the TV is off for the night, and the lights are dimmed, but a substandard backup power source is creating enough mechanical noise to rattle your fillings. By design, the DuroStar DS4000S is built to be quiet, although it does get slightly louder as more load is applied. It projects 69-dB of quietly rumbling sound, so this model won’t have you reaching for earplugs. Just for some perspective, you should know that this decibel level is the same as a modern vacuum cleaner or a regularly conducted conversation. What is it that makes that muted noise profile possible? Check out the 4-point engine isolation mounts for your first clue. This mounting system is designed to stop vibration propagation, so the engine noise stays inside the operational environs of that prime mover. That’s all very well, but won’t the engine exhaust still produce enough noise to keep you awake until the sun puts in an appearance? No, not when the engine muffler system is working in concert with the engine mounts to keep the generator quiet. Start the generator effortlessly, monitor the voltage output, set up your appliances, and retire for the night, all while feeling the absence of the noisy mechanical tones that would otherwise keep your hands planted over your ears all night long. Let’s keep this short by saying the DuroStar DS4000S is not equipped with a parallel hook-up feature. Yes, this handy faculty employs a well-known electrical principle to deliver extra power, but that faculty is normally found on an inverter type backup unit, not a standard engine/alternator model. Having burst this particular bubble, 4000-Watt of peak operating power is immediately output when this bad boy gets going. That output rating does fall to 3300-Watts of optimally tuned running power, which is fairly impressive when you consider how affordable this power provider really is as your go-to backup genny. That last sentence sounds like a segue, so let’s talk about purchasing options. Sold for $529 from Amazon.com, an outlay of less than $600 is happily tendered. 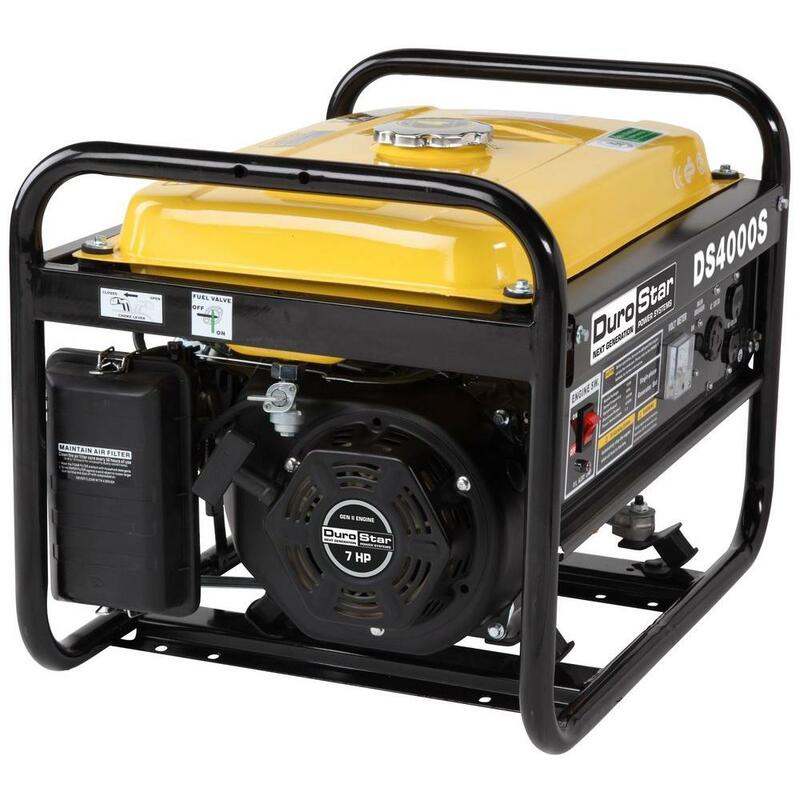 In point of fact, when you dive deep into the online shopping experience, you can easily find this capable generator on sale for around $350. Using a small amount of mathematical talent, you can see a $179 spread appearing, here, so don’t stop at the first quote, not if it’s threatening to burst your wallet. There’s no sly marketing mathematics at work here, just a reliable portable generator and an affordable price point. Your only tip at this point is to seek out a model that’s on sale for under $400, so Amazon.com might not be a safe bet this time around, not unless that price drops. By the way, the optional wheel kit is likely to add a further thirty US dollars to the cost. Plan for that slight monetary hike if the 94-lb machine housing puts a strain on your back. At this point, you’re maybe thinking of switching to an inverter generator. This technology is capable, but it’s more expensive than a conventional generator. Furthermore, since inverter technology uses complex circuitry to transform DC vehicle power into usable AC power, this option is still considered an expensive backup power solution. A toolkit, that’s what’s inside the packaging with the portable generator. You’ll need the screwdriver and wrench if you’ve purchased the optional wheel kit. The last tool in the kit is a spark plug wrench, which is obviously intended for engine maintenance. An operation manual completes the included bits-and-pieces for your new DuroStar generator. However, you’d do well to add a few handy extras to this included toolkit, like a thin-necked oil filling funnel. Better yet, consider an angled funnel because the oil filling opening can be kind of hard to reach. On another note, and this point again references oil and gasoline filling, do put a hold on your fluid filling habits until you’ve assembled the optional wheel kit. After all, you might need to invert the equipment when you’re installing those wheels, and you don’t want any of that engine fluid leaking, do you? A 1-year limited warranty protects all parts from operational damage. Support that warranty by performing a few key maintenance routines on the engine. Remember, engines rely on their various fluids, on their fuels and lubricants, so keep those liquid reservoirs full, as instructed to by the included manual. The DuroStar DS4000S requires an oil change after it has been running for 20 hours. Do not skip this step. Defend that warranty by keeping the oil clean, the fuel flowing, and both fluid reservoirs properly maintained. In other words, read the manual and follow its directions to the word. Features an EZ-Pull recoil start mechanism. Pulled from Amazon.com, the following concerns have made enough impact to warrant a mention. First off, the oil changing procedure seems to catch out some users. Keep a cleaning rag close by, for the 10-mm hex drain plug and the oil fill opening are both hard to access. Other reviewers lauded the DuroStar DS4000S but wished it had 220-Volt output, which would have seen the generator powering an energy-hungry AC unit. Finally, you should inspect the box when it arrives. Some packaging issues have caused concern, and you don’t want to be stuck with an ill-treated model because the packaging company has played rough-and-tumble with the box. If the packaging isn’t properly compressed around the engine and fuel tank, there could be damage to handle. Make sure you have a return policy on hand if this unfortunate scenario occurs. In conclusion, you’re getting a respectable amount of portable power at an affordable price. The DuroStar DS4000S isn’t exactly a lightweight, but it’s certainly small enough and light enough to be handled by you and a friend. Just lift by the rugged steel frame, right at the two uppermost, horizontally oriented frame segments. Alternatively, purchase and fit that optional wheel kit. Supplying 4000-Watts of starting power and 3300-Watts of running power, the 120-Volt outlets, all three of them, can power numerous appliances in an emergency, recreational, or work situation. Indeed, it’s this compact built, plus the reliable features listed above, that have made this portable backup generator a bestseller for quite a few years now. Fueled by everyday gasoline, armed with an easy start mechanism, and safely protected by an invaluable low-oil shutdown feature, this highly capable 7 HP OHV engine and its power generating innards are built to deliver exceptional performance. Yes, you’re buying a mid-range generator, but it’s one that comes with an impressive reputation. Great generator, Bought it right before Harvey hit here in Houston and it was a great help for the week where we had no power in the house. It could run both our AC, fridge and lights in the whole house.